The car performing the figure 8 test at dynamics. 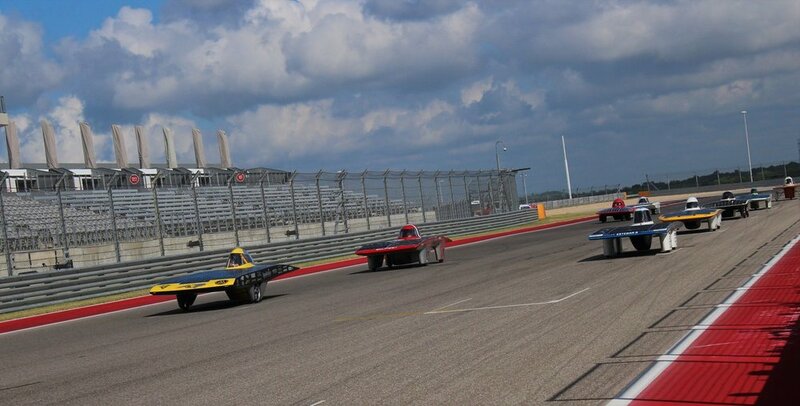 The cars lined up for the start of the first day of racing. Hopefully SunStang is in this picture for tomorrow's driving. 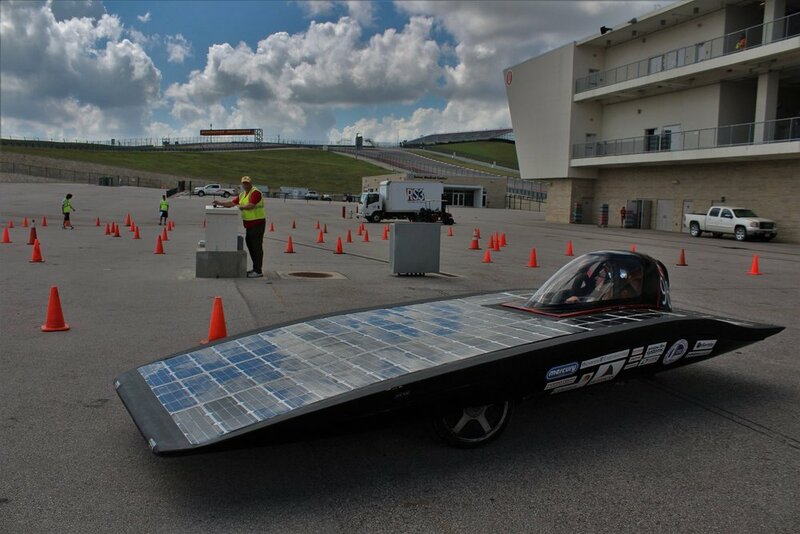 The first day of racing is in the books but unfortunately SunStang was still dealing with motor and battery problems. In the morning, the team got half-way through dynamics before a battery module went bad and the team had to return to the garage. At that point the team still required green status in dynamics, driver operation, lights and vision, body and sizing and the battery protection system in order to get on the track. Throughout the afternoon the team worked on fixing the major motor problem affecting the relays in the car. There were moments where everything seemed to work before suddenly stopping again; the cause of multiple moments of frustration for everyone in the garage. As other teams started counting laps the SunStang crew worked furiously to be able to get back to dynamics to finish the brake and slalom tests. As the day stretched on it seemed that every fix to the car created a new problem to deal with; keeping the team busy all afternoon. The group watched as other teams began heading back to their hotels at the end of the day, soaking wet from the torrential rain in the late afternoon, while we continued to work away at the vehicle. However, slowly progress became visible as first the motor would work for small stretches before operating faster and longer every test. As night crept upon the team they were in the parking lot jogging alongside the car, dodging puddles as they went, building excitement with each test being more successful than the last. Finally, in the last test drive of the night the team's car pulled out of the garage and purred down the parking lot and back. With smiles on everyone's faces the team drove back into the garage, cleaned-up shop and went home for the night. With an early start tomorrow morning SunStang is hoping to be done dynamics and obtaining green in every scrutineering station before tomorrow afternoon so we can join the other teams out on the track.